Sherman Oaks, CA, July, 2009 - After five years of lockout by producer Dr. Dre, Ocean Way's famed Record One studios have reopened. The first project was mixing Trevor Rabin's score for Disney's upcoming "G-Force," about a specially trained squad of guinea pigs out to save the world from evil. 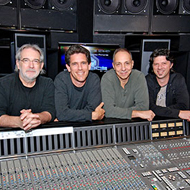 Tommy Vicari and Steve Kempster were mix engineers. The newly reopened Record One features a half-million dollar remodel and in Studio A, the installation of the largest and most sophisticated SSL Film console ever built, which was acquired from Todd-AO Scoring when it shut down operations in Studio City. Studio B features a large tracking room and an SSL custom 9080J console. All studios feature LCR custom-designed Ocean Way monitor systems. Additional amenities include private lounges, full gourmet kitchen/dining room and a sumptuous living room with classic furniture and artworks. In addition to recent top sellers by Dr. Dre, Eminem and 50 Cent, some of the many historic albums recorded at Record One include Quincy Jones' "Back on the Block." Also completed at Record One was his follow-up,"Juke Joint," and Michael Jackson's "Bad," "Dangerous," and "HIStory," all of which were recorded by Bruce Swedien and received Grammys for Best Engineered Album and sold in excess of 65 million records collectively.